Sound quality & Clarity. Low end & pounch. Good high end. Weather proof. Sufficient power handeling (100 w). Low price. White finish that merges into the enviorment. I'm not sure that this is exactly the same model as you describe here. 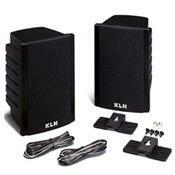 Mine are KLH SAT-5W white, 100Watt per speaker. I bought these speakers in order to use them on a backyard or in the bathroom. I didn't install them, I just tested them with my NAD receiver and with my Sony CD Changer instead of my Mission speakers. I re-packed them for future use. I was surprised and impresed by the sound quality and clarity as well as the low and high end. The price at Sam's is a bargain relatively to others (70-100$).